Nations Press feature news LOOK: JESUS CHRIST Image appears during Inauguration! What does it mean? LOOK: JESUS CHRIST Image appears during Inauguration! What does it mean? members, government officials, invited guests including past presidents Fidel Ramos and Joseph Estrada, members of the first family, and his close friends. 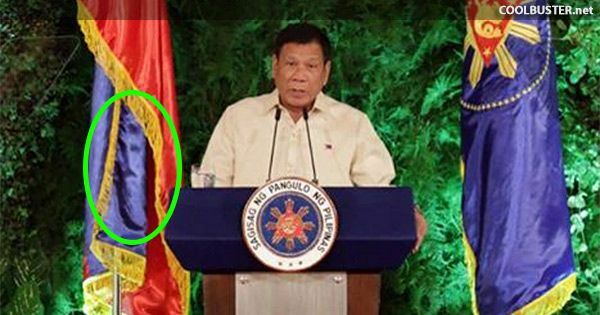 Many netizens give attention to the Philippine flag hanging beside the New PH President. The said Photo has an image of Jesus Christ,at first, some netizens thought that the photo was edited, but the curious ones reviewed the video of the inauguration and said that it is real and can be seen there. The picture attached in this article is a screenshot taken by Inquirer.net, which the publication posted on its official Facebook page. Some netizens said they believe that the strange occurrence only means one thing: the country will be blessed under the Duterte administration.